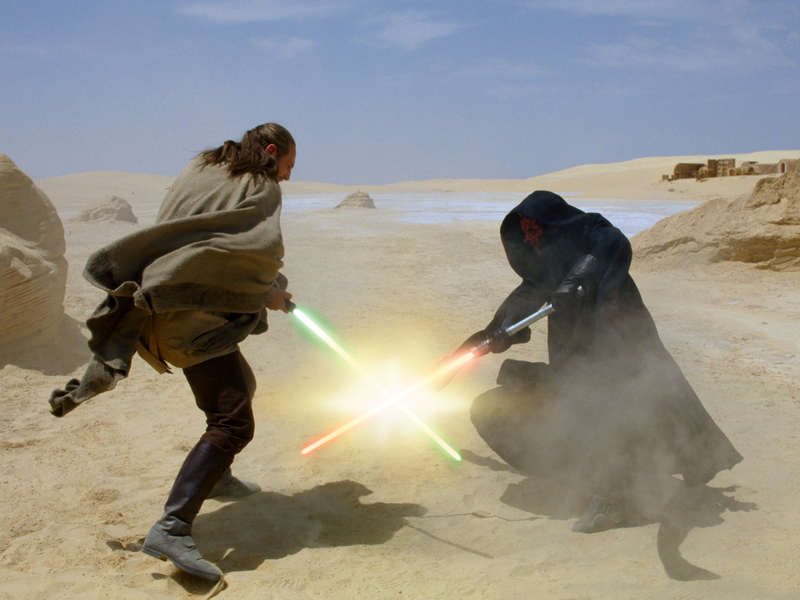 Master Jinn and Darth Maul battle on Tatooine. As a viewer of The Phantom Menace, you and I already know at this point in the movie that the attacker was a Sith who goes by the name of Darth Maul. Earlier in the film, the audience is introduced to Maul when Darth Sidious, Maul’s master, presents him to the Viceroy of the Trade Federation in a hologram. However, the Jedi are oblivious to the knowledge we are granted. Can we fault them for this ignorance? As Master Mundi adamantly notes, the Sith have been extinct for a millennia. The Jedi certainly have reason for their believing this, we can presume. Plus, the Jedi are powerful in the ways of the Force, and as Master Windu explains, the Sith could not have returned without the Jedi Order, and particularly the Jedi Council, knowing…right? Darth Maul and Darth Sidious hold a secret meeting on Coruscant. Though Maul is speaking to Sidious when he says the above line, in reality, it is really a line that is perfectly placed for OUR sake. Again, as a viewer, we are privy to two vital pieces of information that the Jedi are not aware of when Maul delivers this line. First, Maul lets us know that the Sith have been in hiding from the Jedi, juxtaposing the two enemies in stark and symbolic ways. While the Jedi have operated out in the open, IN THE LIGHT, the Sith have operated in shadow, IN THE DARK. You get what I am driving at. Secondly, Maul tells us that the Sith are seeking revenge against the Jedi. Should we expect anything less from users of the Dark Side of the Force? After seeing The Phantom Menace when I was younger, I often pondered why it was the Sith wanted revenge. How naive I was! It is in their nature, plain and simple. DID the Jedi DO something to prompt the Sith to retribution? Most likely yes, but then again, it really doesn’t matter. People can just as easily seek retribution for perceived injustices as well as real ones. I could easily stop everything and go on a tangent to speculate on thoughts/answers to all of the reasons for the revenge of the Sith, but instead, I will let you use your imagination to provide your own answer(s) for why the Sith wanted their revenge. But to at least provide a piece of an answer, I will say this much: whatever it was the Jedi did, it happened at least 1,000 years ago. The Sith have been hidden, out of sight for the last 1,000 years, causing the Jedi to believe their enemies are gone, no longer a threat to the galaxy. The Sith have been patient, growing stronger in the Dark Side as they hide from not just the Jedi, but the galaxy at large, blending into the background. As for the Jedi…when Qui-Gon states that he fought a Sith Lord on Tatooine, Master Mundi and Windu dismiss the claim outright. Impossible! The Sith are extinct! The Sith could not reappear without us knowing! Even Master Yoda, the oldest and wisest of all the Jedi, says nothing to validate Qui-Gon’s conclusion. In fact, what Yoda does say, “Hard to see, the Dark Side is,” is an insult to the Council he leads. When Mace Windu finally acknowledges that the mysterious warrior was a Sith, it is too little, too late. Qui-Gon is already dead, stabbed through the gut by the young Sith Lord’s red blade. Acknowledging that he was a Sith earlier might not have saved Qui-Gon’s life, but that is also not really the point. None of the members of the Jedi Council take Qui-Gon seriously! He is a Jedi Master and had gone toe-to-toe with a vicious warrior using skills only a Jedi should have, but the Council turns a blind eye to the possibility that this attacker was a Sith, sure of themselves and their judgment. The Jedi believed the Sith to be extinct, but they were deceived…not by the Sith, but by themselves. Certainly, the Sith played their part, hiding in plain sight, blending into the background. In fact, they were so effective at remaining anonymous that it is they who choose to reveal themselves with Darth Maul’s attack on Qui-Gon Jinn; and even once they did, the Jedi still faltered, not wanting to believe the Sith could have returned. Their deception, their anonymity, their revelation, all are a testament to the Sith, their cunning, their machinations, and their control of the Dark Side. But it is the Jedi, and their hubris, that allowed for the Sith to survive in shadow. As the hours after that final victory over the Sith turned into days, days to weeks, weeks to months, months to years, years to decades, and so on, the Sith, still very much present, slowly worked at casting a shadow over the Light as they prepared for their revenge. The newly minted Darth Vader marches into the Jedi Temple, beginning the Jedi Purge. 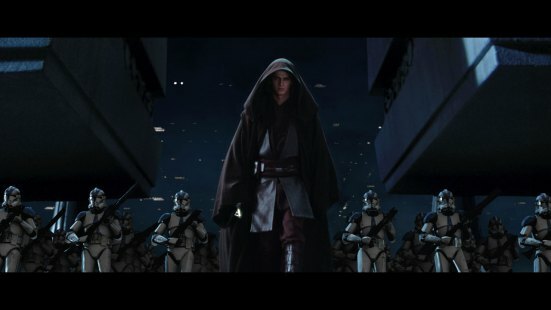 When the Jedi Order falls in Revenge of the Sith, it is the culmination of at least 1,000 years of preparation on the part of the Sith Order, but also 1,000 years of smug complacency on the part of the Jedi. Lulled into a false sense of security by their own hubris, the Jedi Order was caught off guard when the Sith re-emerged, falling into the trap the Sith had laid. Had the Jedi Order actively sought out the Sith after its “destruction,” perhaps the remnants of the Sith would have been discovered and finally dealt with, though even then, the Jedi could not let their guard down. Or, maybe the Sith wouldn’t have been discovered, but at least the Jedi would have continued to take the Sith seriously, remaining vigilante against the possible return of their ancient foe. Either way, it was the responsibility of the Jedi to protect the galaxy against the Sith Order, to ensure that the tyranny of the Sith never again left the galaxy in darkness. But in the end, the Jedi failed, victims of the hubris that drove them into the bowels of destruction. The Sith though, well, they acted perfectly because they acted like Sith. What more could one ask for?